Our guests from Switzerland arrived and hubby and I decided to give them our bedroom. Since they have a new baby we'd thought they'd be more comfortable on the main floor. So we moved our stuff down to the guest room. Can I say I haven't slept as well as I did last night in over 6 months? !I don't know if it's the bed or the darkness down here but, MAN, I finally figured out why no one ever leaves my house. Lol! This is my guest room. It is not a black & white picture. 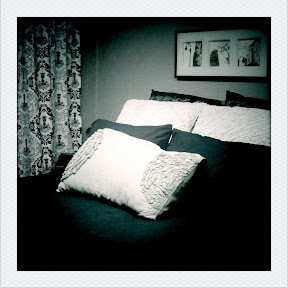 The walls are grey and the bed linens are black and grey and the curtain is black and white. Hey, did I ever share how I had a hoarding session at West Elm and got a ridiculous amount of linens for "start the car" prices? My shams were all $4.95 each - even the Euro shams (yeah, that's not a typo) and I got 3 duvet covers (the one in the pic is from Ikea) for $14.95 each. WHAT? I kept asking the girl at WE if the prices listed were right. She reassured me about 5 times (yeah, I think I annoyed her) that they were indeed on super sale because they were all floor models. Hahaha! So, that's the trick y'all. Go to WE right when they are about to redo all their floor model beds and buy the linens at a ridiculous discount. Nothing some Gain detergent can't fix, right? I still get giddy every time I tell that story. Our guests brought tons of chocolate and cheese from Switzerland (don't hate) and a delicious butterball of a baby. I haven't held a baby in a while so I'm excited to get my sweet baby cheek fix. I checked my blog stats today and last month I had over 20,000 visitors! I have to say thank you to you all so much for dropping by and reading my crazy rants. I hope to continue learning and sharing each week (in my regular-irregular way). Now back to my physical guests, which lately seem to number in the same 20,000 range (or at least it feels that way most days). I guess I should just be happy that people want to be in my home sharing moments with me and my family, right? Have a super fabulous weekend full of SWEETNESS with the ones you love!